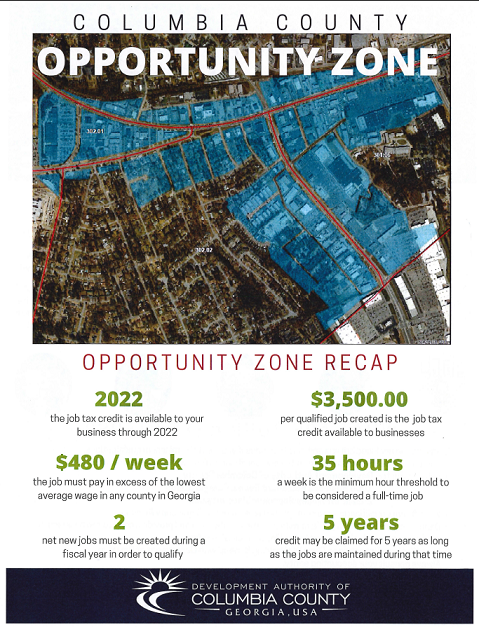 The Development Authority took the necessary steps to establish the West Town Shopping Center and surrounding corridor as an Opportunity Zone with the Georgia Department of Community Affairs. An Opportunity Zone allows the local governments to support the revitalization of commercial areas in the community. It may also help you grow your business by incentivizing job creation and business expansion! Jobs must be full-time working a minimum of 35 hours per week. Jobs must pay in excess of the lowest average wage in Georgia ($24,960.00 annually). Must be offered health insurance, although the employer is not required to pay for it. Review the enclosed criteria and map to assess if you meet the minimum qualifications. Complete Part One of the Opportunity Zone Certification form with your accountant. We will verify qualification and contact the Department of Community Affairs. Department of Community Affairs will verify the Certification and provide a copy to the business, to the Development Authority, and to the Department of Revenue.